According to a new infographic from Glassdoor, there are currently more than 17 million healthcare professionals in the U.S., and 64 percent of them plan to look for a new job in the next year. And if employers hope to attract these job seekers, they’ll need to know the how and what of recruiting workers in the health industry. 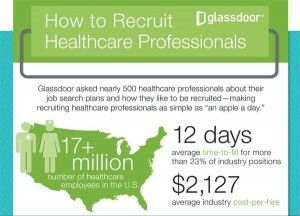 Glassdoor’s infographic, “How to Recruit Healthcare Professionals,” has this covered as it breaks down how to attract and recruit today’s healthcare workers. Healthcare workers respond differently to recruitment tactics. For example, the infographic notes that 43 percent respond to social media outreach and 34 percent respond to hosted meetup events that offer the opportunity to network with current healthcare professionals. Yet, just 17 percent of video interviews from healthcare pros that work for a company or hospital are effective. Three-fourths (75%) of healthcare pros would leave their jobs because of salary and compensation, but don’t think this means you can attract these workers with money alone. Another 66 percent said they’re likely to accept less money to work for a company/hospital with a great company culture. A whopping 94 percent of healthcare pros read online reviews about a company before accepting a job offer, while 67 percent rely on current work colleagues.